We offer double column medical storage cabinets secured by a key locking roll-up tambour door. Utilizing the most innovative modular tray system on the market, our mobile medical storage cabinets can be configured for use in Arthroscopy, Cardiology, Catheterization, Cystoscopy, Endovascular Labs, ENT, Interventional Radiology, Laparoscopy, Ophthalmology, Orthopedic, Neurology, Urology and Vascular. We also have a cabinet that stores and dries up to 16 scopes. Each cabinet features two fans and a HEPA filter for drying scopes. 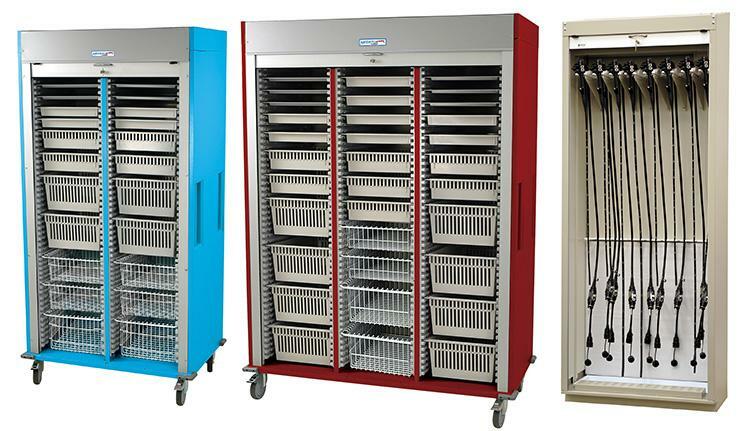 Our medical storage cabinets can be purchased with our without the HEPA filtration and drying fans. Accommodates colonoscopies, EUS Scopes, TEE probes, bronchoscopes and cystoscopes.